Create new revenue stream with online security services! Nexway helps you bring added value to your current customers with new recurring revenues. BNL is one of Italy’s major banking groups, with approximately 2.5 million individual customers, 130,000 SMB and professionals and 33,000 companies and public institutions. BNL, a leading bank in Italy and part of the BNP Paribas group, wanted to offer their existing customers a multiservice protection digital solution: “Protezione Identità”. Kaspersky Total Security Multi-device, the most advanced protection from Kaspersky Laboratories. Sicurnet Service, prevents identity theft and fraud of personal data online. Insurance coverage offering assistance and refund for legal expenses in case of identity and personal financial data theft. Protezione Identità being an ongoing service, clients benefitting from it would then be billed on a monthly basis through their BNL bank account. In order to support this subscription business model and guarantee a continuity of service for “Protezione Identità”, BNL needed partners not only capable of delivering the service at the moment of sale, but also manage fulfillment for the duration customer’s lifecycle. This implied not only being able to integrate BNL’s specific operational, reporting and data requirements, but also manage the events and actions necessary to any recurring billing business model: renewals, cancellation, yearly re-engagement by tacit agreement, end of service. 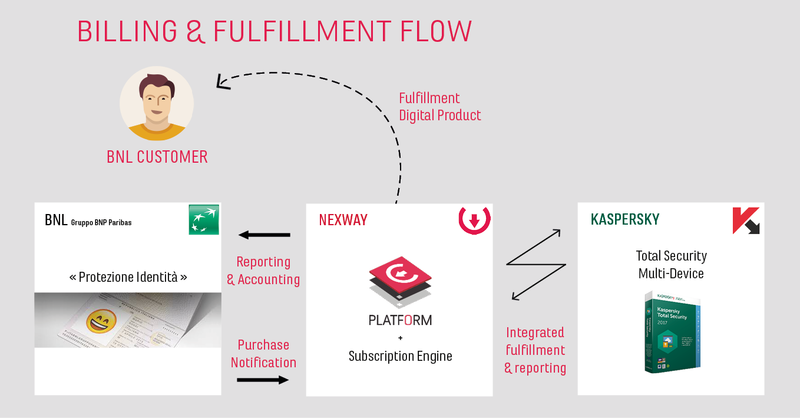 As a longtime partner of Kaspersky Labs, Nexway had extended experience in the digital distribution and subscription management of Kaspersky products. In addition, through the use of our ecommerce platform, associated webservices, and technical knowhow, we were able to integrate BNL’s workflow requirements and process preformatted data indispensable to the fullfillment of the bank’s new offering to their existing customers. As a service provider (ISP, Telco, Bank, Insurance) get rapidly new recurring and incremental revenues through carrier billing method and bring added value services to your customers. Sell B2C software products through a B2B2C digital distribution model. Allow to a publisher partner to promote software individually or as part of a bundled offer proposed by you. Bring added value to your services portfolio. BNL is one of Italy’s major banking groups, with approximately 3 million individual customers and 43,000 business and institutional clients. Kaspersky Lab is a global cybersecurity company celebrating its 20 year anniversary in 2017. Kaspersky Lab’s deep threat intelligence and security expertise is constantly transforming into security solutions and services to protect businesses, critical infrastructure, governments and consumers around the globe. The company’s comprehensive security portfolio includes leading endpoint protection and a number of specialized security solutions and services to fight sophisticated and evolving digital threats. Over 400 million users are protected by Kaspersky Lab technologies and the company helps 270,000 corporate clients protect what matters most to them. Learn more at www.kaspersky.com . Interested in bringing value to your offer and proposing added service to your end-users ? Get in touch !